For a few years now I've been making do with a two-piece approach for recording from my Rode NTG-3 shotgun microphone. 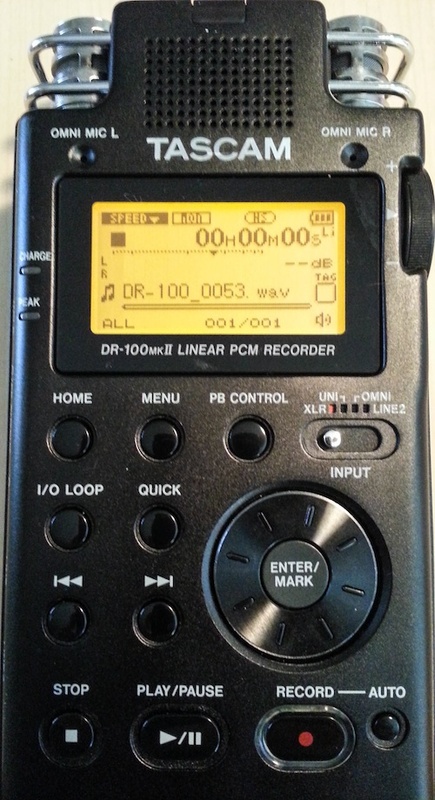 I've had my Roland Edirol R-09 digital recorder for about five years and I like it. It's small and the onboard mics are decent for quick recordings, but it only has an 1/8" mic input. I can't just use an XLR to 1/8" adapter for the NTG-3 like I used to use with the Audio Technica AT897 shotgun condenser mic. Condenser mics need 48 volt phantom power to operate. The AT897 can also be powered by an internal AA battery so the adapter cable was an option. I couldn't take my desktop mixer to location shoots with no power to plug into so I also needed a portable mixer. I didn't have the money to get a really nice, professional eight channel mixer so I found something affordable and battery powered. The Azden FMX-32 is a three channel mixer that can supply phantom power. It was a good solution at the time and even to the present. I just used it on my last two shoots. It allowed me to mix two wireless lavs into one of the stereo channels and have the shotgun boom mic on the other channel. The FMX-32 also has the option of separate XLR outputs for each channel or a 1/8" stereo jack which I needed for my R-09 recorder. Getting the delicate balance of input gain on TWO parts of an audio chain can be a little tricky. I don't need a setup where audio clipping could happen in two places. Having two pieces of equipment means I need more batteries. The mixer requires six AA batteries and the recorder requires two. It's just another point of possible failure. To top it all off the two pieces of equipment made it awkward to put into a bag so it was always held by the boom operator (making operating the boom difficult to say the least), lying on the ground or in some other way open to being a drop/crush/kick victim. Because of these reasons I have been looking for a better indie filmmaking sound recorder. I have been considering buying a Zoom H4N for quite a while. It seems to be the go-to recorder for independent filmmaking. We have one where I work and I've used it a couple times, but it just seems too fiddly. I'm not a fan of the menu setup. And the input level control is a two-button setup on the side of the recorder much like my R-09 recorder. I'm trying to get away from that. I spent about a week reading up on different recorders before I decided on the Tascam DR-100mkII. From reviews I've read there doesn't seem to be much difference in sound quality between the H4N and the DR-100mkII. But having hardware controls in place of menu items for frequently used features is priceless. My favorite is the input gain knob on the side of the recorder. To increase the gain on both channels at once I can just spin the wheel with my thumb. It's silent! Unlike those buttons on the side of the other recorders. Only increasing the gain on one channel can be a little more tricky. The inner knob and outter knob must be manipulated at the same time. Less convenient that having separate control knobs for each channel of audio but loads better than click-click-click buttons that might ruin a take. 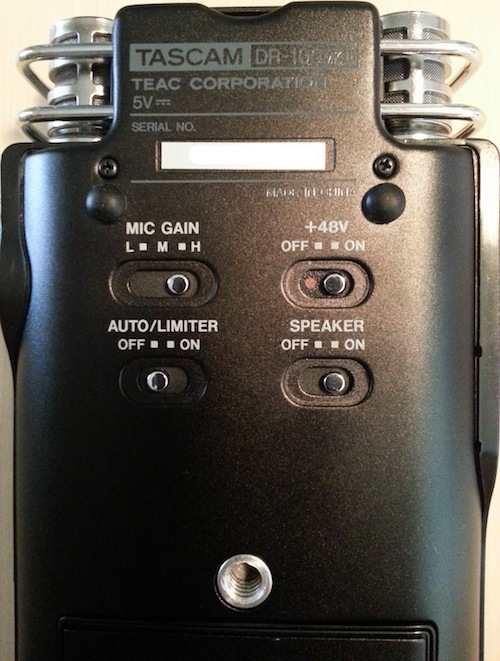 On the back of the unit there are switches for mic gain (low, med., high, although it seems like "high" is the best setting), on and off for phantom power and limiter, and a switch to silence the internel speaker. Hands down my favorite feature of the DR-100mkII (not the name because that's a mouthful) is the dual power. It has a rechargable battery that is charged when attached to a USB power source AND a compartment for two AA batteries. It will run on the rechargable battery until it is depleted and then automatically switch over to the AA batteries. On short shoots it could run on rechargable only. Over the course of a year that's a savings in batteries and worry. The street price for the DR-100mkII is around $300, but you can find them on Amazon Marketplace frequently for somewhere in the low $200s. That's how I got mine. What recorder do you use?